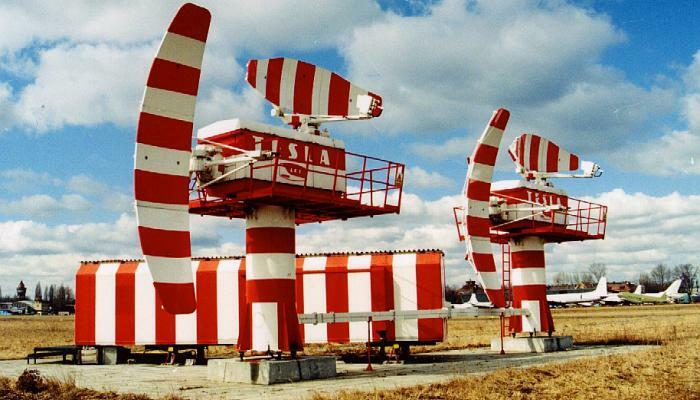 The RP-5G is a Precision Approach Radar(PAR) produced by the former TESLA Company in Pardubice (Czech Republic). It is still in operation at many airports in Eastern Europe and Asia and there are available many offers of Eastern European companies for modernization of this radar. The RP-5G practically consists of two independent radar devices: one for the course and one for the glide path. Each single device is a radar of two identical tunable magnetron transmitters using frequency diversity. The frequency spacing between these channels is 150 MHz, the time interval between the two transmit pulses is 1 microsecond. It works with three different pulse repetition frequencies which are in the ratio of 9:10:11 and are repeated every three pulse periods. This measure reduces the effect of blind speeds in the moving target indication. Along with its two different transmission frequencies, canot occur blind speeds The intermediate frequency in the receivers is 30 MHz with a bandwidth of 3.2 MHz. The noise figure of the receiver is 8 dB. The antennas consist of parabolic reflectors, the horn feeds and the polarizers. The horizontal course-antenna swivels either ± 10 ° or ± 15 ° from the center line. It can be set a mechanical tilt of -2,5 … +7,5 degrees. The vertically aligned glide slope antenna is nodding	-1 to + 9 degrees from the horizontal line. A complete cycle is carried out with a speed of about 0.6 Hz, the data renewal rate is at least 1 Hz. The antennas can work with linear or circular polarization. Using circular polarization the radar can better detect the point targets (aircrafts) within a volume target (rainfall region). Since in this type of polarization the reflections of randomly distributed hydrometeors are slightly suppressed.